Milky Way portrait: Night sky photo with a shooting star and lightning flash. Photographer Randy Halverson is good. Very, very good. So much so that I picked one of his shots to go in my gallery of the year’s best astrophotos. 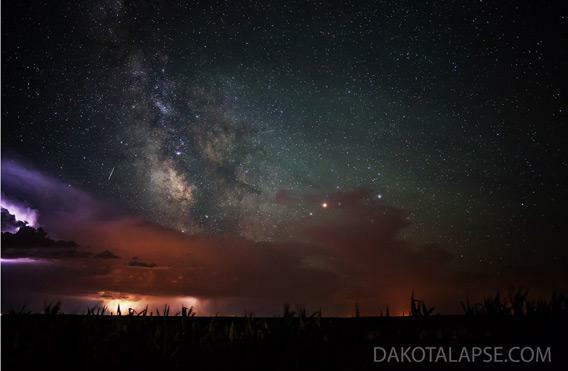 Storm, sky, and shooting star over South Dakota. Click to ablatenate. Click that to embiggen it! When you do, you’ll see why I like it. The Milky Way glows over the landscape, the combined might of billions of stars, their vast distance reducing their luminosity to a mere whisper. In the foreground a storm rages, lightning illuminating the clouds to a red and purple glow. And above it, apparently attempting to connect the two, the brief flash of a shooting star: A bit of cosmic debris no bigger than a grain of sand, heated to luminescence by its tremendous speed as it rams through our air. As an added bonus, on the right is the ruddy glow of Antares, a red supergiant star that marks the heart of Scorpius, the scorpion. One day that star will explode, and from its distance of only about 500 light years it will shine about as bright as the full Moon! But that may not happen for hundreds of thousands of years. I love the sense of scale in this shot: The clouds a few kilometers away, the meteor a few hundred, Antares a few thousand trillion, and the merged stars of our galaxy deep in the background, a hundred thousand trillion kilometers further yet. If there’s one thing I love about astronomy—and there are far more, I assure you—it’s the sheer size of it. From here to eternity, indeed.